There isn’t a single area in which this new Mazda MX-5 fails to surpass its predecessor. It’s shorter, lighter, more spacious and better laid out. It’s sharper-looking but still disarming and distinctive. It’s faster, more frugal and even more vibrant and engaging to drive.” So read our road test verdict one year and two weeks ago (give or take a day), prior to awarding the car a four-and-a-half-star verdict. That lost half star? We’d tested the 1.5 and reckoned the 2.0-litre model would probably, all things considered, be the superior choice for the harder-edged enthusiast driver typical of the Autocar reader. And whether it be an entry-level model or top end, the compliments have kept on coming for what must now surely be considered the definitive, standard-setting – dare we write ‘iconic’, given the name of this special-edition car we’ve come to test? – affordable sports car not only of this generation but also of several before. It triumphed outright in our ‘Junior Handling Day’ test for new cars with a sub-£30k price tag, duffed up cars with an extra digit on the asking price in our full-fat Britain’s Best Driver’s Car shootout last year and won us over during its tenure with us as a long-termer, to the extent that Steve Cropley has bought it, because he can’t bear to see it go. Now, though, we have the chance to delve deeper. The opportunity is a two-day, 828-mile drive around the Ring of Iceland, two up but without interruption or support (beyond a packed lunch), with only our thoughts for company on the glaciercarved and volcano-contoured roads for 12 hours a day. “If you need help, it’ll be several hours away if you’re lucky, so try not to need help,” smiled the man from Mazda as he handed over the keys. If we thought we knew the MX-5 before this trip, there’s no question that we will know it better at the end. As definitive as an Autocar road test is, unsurpassed in its assessment and rigour, there’s still nothing like a long, lonely drive for really getting to know a car. The excuse, lest you feel we need one, is the MX-5 Icon special edition. It would be easy to dismiss it with the wave of a hand – to all intents and purposes it is ‘special’ in the lightest sense: a well-kitted, well-priced 1.5 SE-L Nav bedecked in striking paintwork on its door mirrors, rear spoiler and front skirt and with some stickers down the side. But it is also the latest in the line of Icon-badged MX-5s, lending the launch a hint of history and giving Mazda’s marketeers another opportunity to keep sales rolling along. This time, just 600 Icons will be sold in the UK, complete with numbered plaque in the cabin. If you’re a collector or fan and counting, that’s fewer Icons than ever before; 750 were launched in 2000, 1563 in 2005 and 1250 in 2007. While MX-5s have never been especially tenacious at holding onto their value, there’s a kudos – and kit list, including parking aids, leather seats and automatic headlights and wipers – that some will covet. Not that it really matters as we turn the key in Reykjavik for the start of our road trip, which is punctuated by a night’s sleep in Egilsstaðir, on the east coast of the island. The familiar qualities of the latest MX-5 stand out once again: a seating position and seat that flatter drivers of every shape and size, perfect pedal spacing (good old-fashioned heel-and-toeing is alive and well here) and controls that have been placed with thought and which are well weighted. Spend too long in the MX-5 and you will take these things for granted, but that would be a huge mistake, because so many car manufacturers get them wrong. They don’t just make the MX-5 better to drive; they also make it more habitable. Let me remind you that I’m writing this after spending about 22 of the past 36 hours in the car. I may not be the freshest of daisies, but I owe what reserves I have to the hours of toil engineers put into perfecting that seating position and cabin. Out on the road, it’s impossible not to marvel at the sights and sounds of Icelandic life, which can be as seductive as the car itself. Our route takes us along the western edge of the island, before looping back up north and around in a clockwise direction. Stare again at the map and give your vocal chords a chance to stretch out by attempting to pronounce Skagafjörður, or perhaps Fjarðabyggð. Take a moment to pity the world’s newsreaders who were faced with having to explain the ash cloud crisis in 2010, sparked as it was by a volcano named Eyjafjallajökull. These unpronounceable place names do a neat job of encapsulating the quirky and brutal yet enchanting look and feel of a country of terrifying natural beauty, from its snow-lined volcanoes to steaming geysers, deep blue lakes and multicoloured natural night-time cinema courtesy of the aurora borealis. But the real beauty of this trip is that not even zealous policing via the medium of a blanket 90km/h (56mph) speed limit and a liberal deployment of radar guns could ruin it. While that limit doesn’t sound a lot – nor does it sometimes feel it when you haven’t seen a car coming towards you for an hour, as often happens – it’s just fine in the MX-5. Here is a car that provides thrills even on the ‘wrong’ road, so precise are its controls and so modest are its power output and top speed. Given the choice of burbling along in a Ferrari or stroking the MX-5, I’d choose the latter. And when – as happens regularly – there’s the chance to go harder on some of the natural twists and turns of this glacier-carved country, there’s every opportunity to turn up the wick guiltfree. Can a 129bhp 1.5-litre engine with 111lb ft ever be enough to set a keen driver’s trousers on fire? 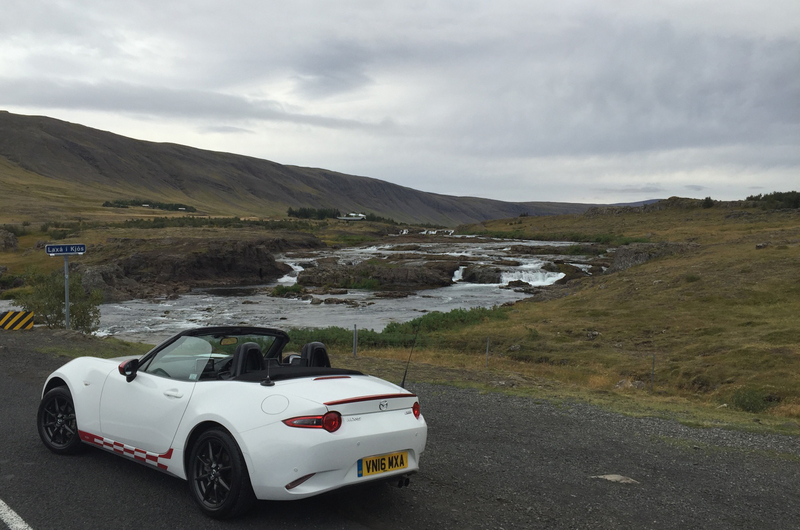 If you need to ponder that question, you haven’t driven the latest MX-5 on a twisting road. There is something just so sweet about driving this car hard. Its not-so-secret ingredients? The sub-1100kg weight, for starters, but also the light clutch, alert throttle and short, tight gearshift that puts a smile on your face every single time you slot it into position. Then there’s the steering, which lets you know exactly what the front wheels are doing and gives confidence on any type of road. And I write that not as an expert helmsmen; there’s an enticingly unintimidating angle to be appreciated about this car, too, if, like me, the thought of 3.0sec 0-60mph sprints and tail-out cornering leave you a bit sweaty-browed. Its precision breeds confidence, its pace thrills without blurring any lines. Here is an engine that might not have anything approaching what you’d truly describe as poke but which reminds you why the advances of turbocharged engines aren’t entirely to our advantage. Blessed with the linear delivery that only a naturally aspirated engine can deliver, it sings its way up to the 7000rpm redline. And while it is undoubtedly at its best spinning around in the mid-range, it’s also true to say that this is a car you can take 100% from more often than not, earning a sense of achievement for your efforts. We recommend the 2.0-litre version for good reason, but there’s an element of accessibility about the 1.5 that is beguiling if you’re prepared to work for it. Some want more from a sports car, of course, but personally I’d rather have the sensation of getting close to the edges of a car’s capabilities than thanking God that I didn’t overstep the mark and bin it. For people like me, it’s an absolute gem. The highlight comes on a twisting road between Akureyri and Mývatn. 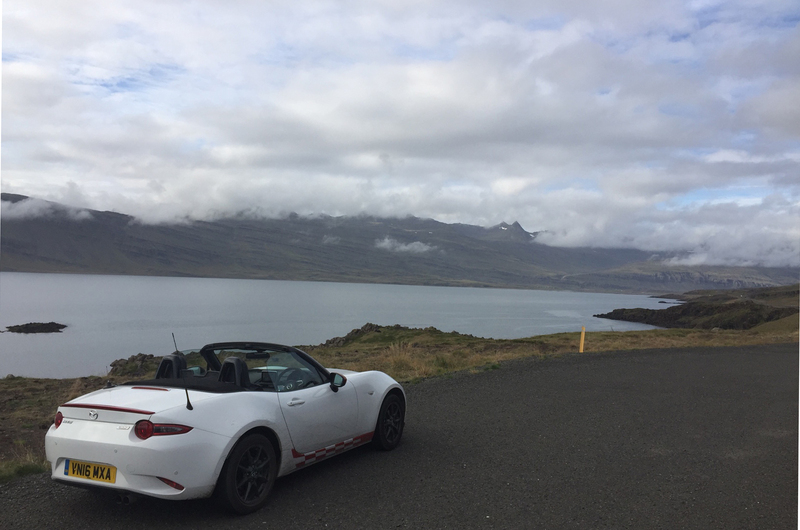 Well and truly settled into the car and landscape, what could be an intriguing high-speed road is turned into a enthralling one by the MX-5’s merits. In some cars, it would be too fast for the faint of heart. In the MX-5, you can throw caution to the wind, pushing hard while knowing that the speed limit is a target to aim at rather than be feared, and that even the slippery, twisting roads can be attacked. If you overstep the limits of traction, it’s telegraphed well in advance. If the back end does go – and it takes severe provocation for it to do so – the MX-5 will oversteer, progressively and entirely controllably. Complaints? There are some, although almost all smack of wanting to have everything from a sports car that costs barely more than £20,000. On the coarser surfaces – including some gravel roads but also, most tellingly, on sections of asphalt that have endured a harsh winter or possibly one of the torrents that ensues after a volcanic eruption has melted large quantities of ice – the bumps and potholes are keenly felt. The pedals, while well spaced, are slightly offset. And – maybe – the body could be better pinned to the road, although if there is an issue it’s marginal and confined to when you’re tackling a series of fast corners that weave back and forth. But why complain when a car is this much fun? Better to enjoy the positives, especially when they’re delivered in such an unobtrusive yet absorbing way. In a world obsessed with wanting more of everything, the MX-5 is an aberration and is to be celebrated for it. 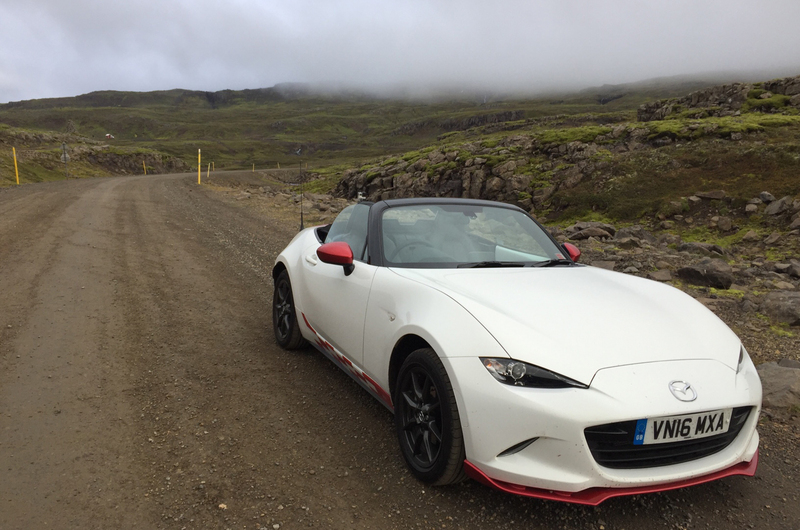 The folk from Mazda had worked that out long before sticking the cars on a boat to Iceland, a country that doesn’t have to make any effort to look good. There are many more parallels that don’t need spelling out, but let’s leave it at this: just as I’m sure Disney’s augmented reality makes many more people happy than do Iceland’s rolling hills, it doesn’t mean that Mickey and his friends have the only answer. With a history awash with innovation and free thinking, from rotary engines of yesteryear to the trend-bucking normally aspirated units of today, it’s easy to be distracted from what really makes Mazda great. After this journey, the answer is as crystal clear as the freshly melted water in Iceland’s lakes: the MX-5’s brilliance lies in how finely judged it is. ‘Just so and not a jot more’ sounds simple but eludes even the most well regarded of car makers. With the MX-5, Mazda has hit the bullseye. Regular readers will know just how wonderful the new MX5 is, so why the need for another reminder? And the statement that "there isn’t a single area in which this new Mazda MX-5 fails to surpass its predecessor" is maybe not quite correct. How about the new model's sales performance? If sales were better, I suspect that we would not be seeing these "special edition" models, big discounts and spurious press articles.